JAFFA, Israel (JTA) — Andromeda Hill is a beachfront complex of luxury apartments connected by tree-lined pathways that features such amenities as a spa and business center. Five minutes down the road is Ajami, a low-income neighborhood profiled in the 2009 film of the same name that remains one of this city’s poorer districts. Such gaps in income have been of mounting concern to Israelis and are high on the agenda of Karnit Flug, the newly appointed governor of the Bank of Israel and the first woman to hold the post. In two recent presentations, Flug has drawn attention to income inequality in Israel and its potentially adverse impact on social cohesion. The Occupy protests that swept the world in 2011, decrying the exploitation of the “99 percent,” demonstrated that Israel is not alone among developed countries in facing large inequities in wealth distribution. But among the 34 countries in the Organization for Economic Cooperation and Development, Israel ranked 30th in terms of wealth inequality. Flug agrees. Israel’s high income inequality, she says, is a function of low educational attainment and high unemployment among Israel’s poorest communities — Arabs and haredi Orthodox Jews. The explosion of Israel’s high-tech sector in the mid-1980s created many jobs for highly educated employees but left behind the poor and unskilled. “Inequality in disposable income distribution rose until 2006 before stabilizing at a very high level,” Flug said last week in a presentation at the Taub Center for Social Policy Studies in Israel. Growing the job market while maintaining a social safety net have been twin goals for Flug, who holds a doctorate in economics from Columbia University. 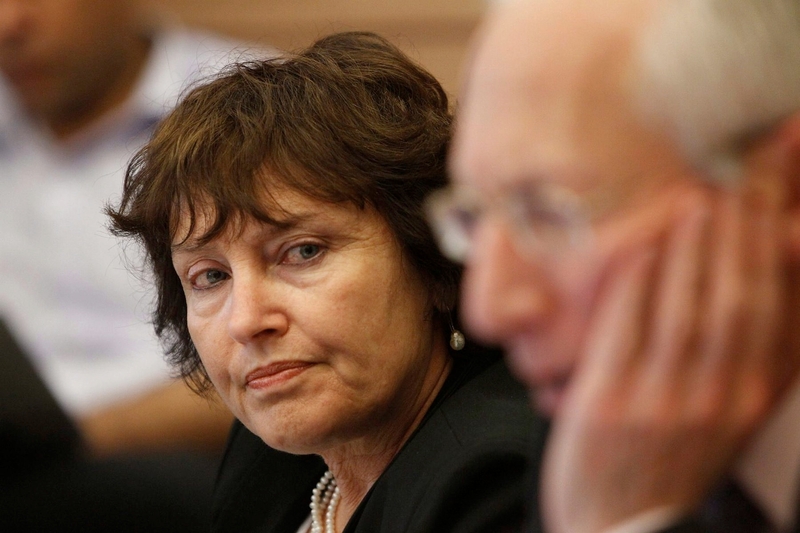 After a four-year stint at the International Monetary Fund, Flug joined the Bank of Israel in 1988 and became its deputy governor in 2011, serving under the well-regarded Stanley Fischer, who departed earlier this year. After a lengthy selection process in which Flug was passed over multiple times, Israeli Prime Minister Benjamin Netanyahu appointed her to the bank’s top post in October. Flug has served on government committees on the defense budget, market competitiveness and the National Insurance Institute. She also served on the Trajtenberg Committee, which was tasked with formulating a response to widespread protests in 2011 over the rising cost of living. The protests were partly a reaction to nearly a decade of privatization and cuts in public benefits. Founded on socialist values, Israel in its early years had a strong safety net and lionized the collectivist ideals of the kibbutz movement. But in the mid-1980s, Israel began to embrace free-market policies and privatize key state-owned companies. The outbreak of the second intifada by the Palestinians led to an economic crisis that prompted the government to cut entitlement spending. The 2011 demonstrations called on the government to restore the safety net. In its report, the Trajtenberg Committee recommended various measures, including raising the capital gains tax, increasing government aid for housing and free early childhood education. In her presentation at the Taub Center, Flug recommended against direct government transfer payments to poor citizens, but she is in favor of Israel’s negative income tax, which provides a tax credit to low wage earners. Flug believes the measure incentivizes work. As governor, Flug’s ability to implement such policies is limited. Like the U.S. Federal Reserve Bank, the Bank of Israel’s function is to set the country’s monetary policy. Taxes, subsidies and incentives for job creation are determined by the Israeli government. But Flug could still have an impact. Jack Habib, director of the Myers-JDC-Brookdale Institute, a think tank that researches poverty in Israel, said Flug could advocate for reforms that bolster Israel’s minorities.